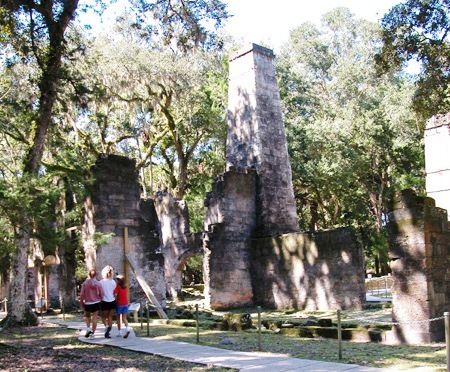 The largest sugar plantation on the east coast of Florida was located in Flagler County, and the plantation’s grounds and ruins today comprise Florida’s Bulow Plantation Ruins Historic State Park. Flagler County, Florida, (pop. 95,696) is a rapidly growing county located in northeast Florida along the Atlantic Ocean. The county, named after American industrialist Henry Flagler, was created from portions of neighboring Volusia and St. Johns counties in 1917. Prior to the arrival of the Spanish in Florida in the 16th century, this region was inhabited by several Indian tribes, including the Timucuans and the Seminoles. By the early 1800s, the area now known as Flagler County was home to an increasing number of large plantations growing cash crops such as sugar cane and corn. The largest sugar plantation on the east coast of Florida was located in Flagler County, and the plantation’s grounds and ruins today comprise Florida’s Bulow Plantation Ruins Historic State Park. In Flagler County’s infancy, cultivation of the Irish potato contributed to its financial success. The county seal acknowledges this contribution by prominently featuring a potato. In the early 20th century, Flagler County was part of the Florida land boom, and its tourism industry expanded. Spurred in part by the increased tourism, population growth precipitated the incorporation of the City of Flagler Beach in 1925 and the 1926 construction of the Flagler County Courthouse in downtown Bunnell. Marineland Dolphin Adventure (previously Marine Studios) opened in Flagler County in 1938 and was the first attraction to feature dolphins trained to perform for audiences. Today, citizen involvement in heritage preservation is thriving in Flagler County, with local organizations such as the Flagler County Historical Society and the City of Palm Coast Historical Society promoting and preserving the history of their respective areas by making accessible to the public their catalogued historical material. Two Corridor Management Entities (CMEs) operate in Flagler County, heavily supported by volunteer efforts. Heritage Crossroads promotes, enhances, and preserves the unique features of the Miles of History Heritage Highway, a Florida Scenic Highway, and the A1A Scenic and Historic Coastal Byway manages the heritage resources associated with the 72-mile A1A corridor through Flagler and St. Johns counties. Beginning in 2011, Flagler County engaged with Friends of Washington Oaks Gardens State Park and the state park itself as part of a public-private partnership to develop interpretive signage and historical information on the park, located in Palm Coast. The project aimed to enhance visitors’ experiences in the park’s “Historic District,” which includes resources dating to a British land grant in the 1770s and earlier Native American settlement and is comprised of historic gardens and other natural and cultural resources. Flagler County offers a variety of regularly scheduled heritage celebrations. Cracker Day celebrates the history of early Florida cowboys, called “crackers” for the sound made by whips when herding cattle. The annual Potato Festival, hosted by the City of Bunnell, the Bunnell Chamber of Commerce, and the Flagler County Chamber of Commerce and Affiliates, celebrates the historical and contemporary importance of potato farming in western Flagler County.